March 9, 2016 – The first U.S. mission to collect a sample of an asteroid and return it to Earth for study is undergoing a major milestone in its environmental testing. NASA’s Origins, Spectral Interpretation, Resource Identification, Security-Regolith Explorer (OSIRIS-REx) spacecraft is in thermal vacuum testing, designed to simulate the harsh environment of space and see how the spacecraft and its instruments operate under ‘flight-like’ conditions. OSIRIS-REx is scheduled to launch in September and travel to the asteroid Bennu to collect a sample and return it to Earth for study. Scientists expect Bennu may hold clues to the origin of the solar system and the source of the water and organic molecules that may have made their way to Earth. On February 11, the orbiter was lifted into a 65-foot-tall thermal vacuum chamber at Lockheed Martin’s facility near Denver, Colorado. OSIRIS-REx will be powered on and off while being in a vacuum and exposed to extreme cold and heat that it will see over its seven-year mission to Bennu. After the air has been removed from the chamber, liquid nitrogen is pumped into tubes that run throughout the wall of the chamber, bringing the temperature down to as low as minus 274 degrees Fahrenheit. A powerful light is turned on periodically to simulate the sun and the heat the spacecraft will experience. Throughout the 22-day test, a team of engineers test and monitor the spacecraft and its instruments 24 hours a day. 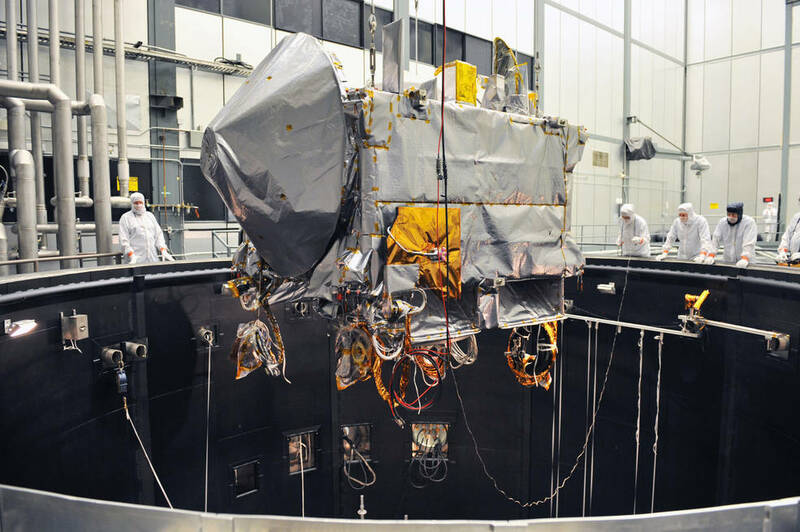 NASA Goddard Space Flight Center in Greenbelt, Maryland provides overall mission management, systems engineering and safety and mission assurance for OSIRIS-REx. The University of Arizona, Tucson leads the science team and observation planning and processing. Lockheed Martin Space Systems in Denver is building the spacecraft. OSIRIS-REx is the third mission in NASA’s New Frontiers Program. NASA’s Marshall Space Flight Center in Huntsville, Alabama, manages New Frontiers for the agency’s Science Mission Directorate in Washington.